One of the things we love most about the Gold Coast is it’s National Parks. This area is known collectively as the Hinterland and is full of the most beautiful scenery. It is the perfect place to spend a few hours or a few days. 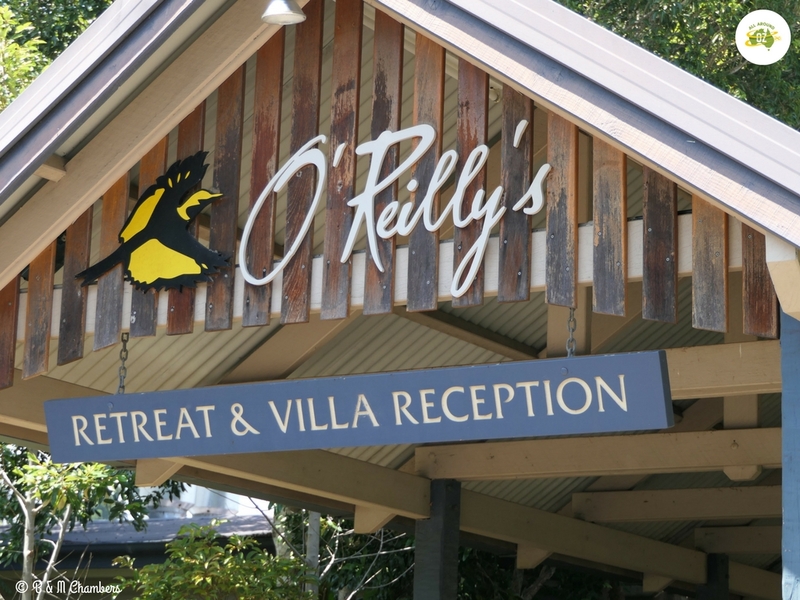 One spot that we hadn’t been to for a long while is O’Reilly’s Rainforest Retreat. Located high in the Green Mountains section of the Lamington National Park, we really had forgotten what a beautiful spot this is. O’Reilly’s is located about an hours drive south of Canungra. The road is sealed all the way, but it is narrow, winding and in many places is only a single lane. It is also not in great condition. There are many places where the road is falling down the hillside. Orange safety barriers guard these areas and road works are in progress in at least two places. Most spots the speed limit is only 40 kilometres or less. Due care should be taken at all times. The single lane sections are controlled by give way signs on the down hill run. In other narrow places there are small areas where a vehicle can pull off to allow another to pass. The road is suitable for two wheel drive vehicles. Once you leave Canungra there is no petrol available so make sure you fill up before heading off. In 1915 the O’Reilly family started hosting visitors in Lamington National Park. Over a hundred years on and O’Reilly’s Rainforest Retreat is still run by members of the O’Reilly family. Part of the history of the O’Reilly’s involves a plane crash in February, 1937. Searchers could not find any trace of the wreckage so 10 days after the crash Bernard O’Reilly set out to search for the downed plane. He found the crash site and was able to rescue two survivors of the crash. A memorial to Bernard and the crash survivors was erected at O’Reillys on the 60th anniversary of the crash. 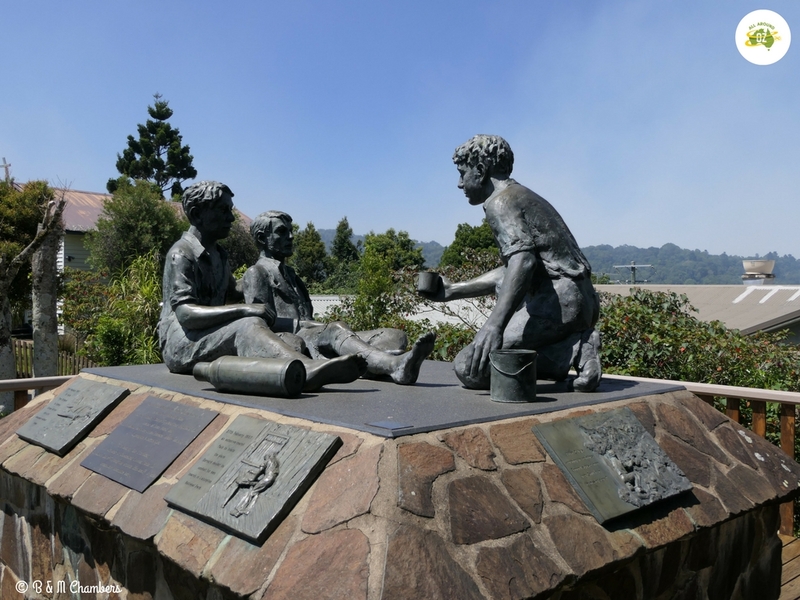 This memorial commemorates the rescue of two plane crash survivors by Bernard O’Reilly in 1937. 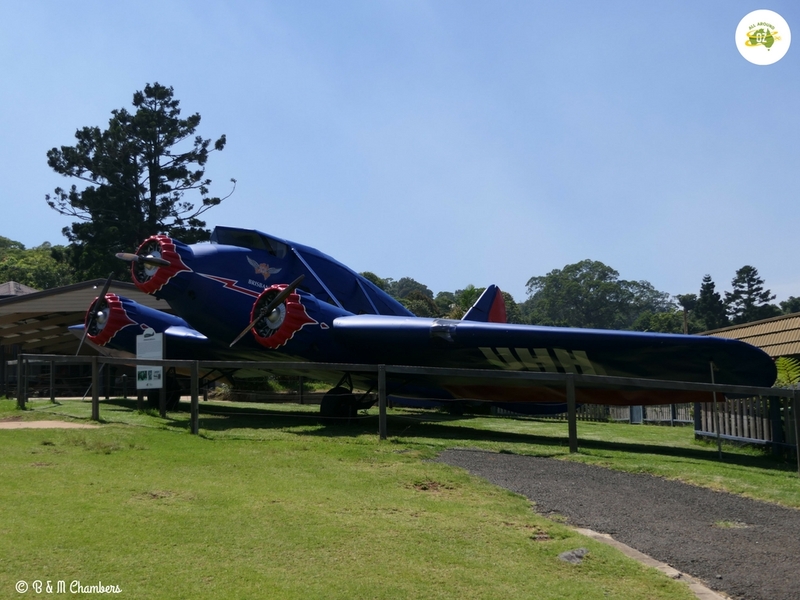 A replica of the plane that crashed, a Stinson airliner also sits at O’Reillys. It was moved there from Victoria in time for the 75th anniversary of the crash in 2012. This model was also used in a 1987 movie of the crash and subsequent rescue. It is a huge plane and is quite an impressive sight. This beautiful area is known for it’s Tree Top Walk. Take a stroll along the Booyong Walk below the rain forest canopy before reaching a series of nine suspension bridges, some of them up to 16 metres above the ground. If you are feeling energetic there is a viewing platform 30 metres up in a fig tree. You will need to climb up two steel ladders to reach the platform. It is a little overgrown now, but you can still see glimpses of the ranges and valley below. It is well-worth doing just to be that high up in a tree. You can get a Bird’s Eye view of Lamington National Park by climbing 30 metres up a giant fig tree. Crossing the nine suspension bridges is a lot of fun. They bounce and move around a lot. Take your time to cross them and remember to look up as well as down as you will be sure to spot some wildlife. At the end of the Tree Top Walk, turn right and this will lead you into the Green Mountains Botanical Gardens. These gardens were established in 1966, but are in a bit of a state now as they are maintained by volunteers. They cover such a huge area that it would be very hard to keep up. However, it is still worth having a wander through them. It’s easy to see how lovely they would have been or could be again. The entrance to the Green Mountain Botanic Gardens. O’Reilly’s is home to flocks of King Parrots and Crimson Rosellas. They are fed daily but are happy to land on your head if they think you may have food. They are quite tame, which means that you can watch them and take photos with little chance of disturbing them. We seem to have found these birds on our travels a lot of late! There are also plenty of other walking tracks around the area ranging from a short 30 minute stroll to full day hikes.I walked the short Centenary Track which goes from the O’Reilly’s car park, past the Green Mountain Campground and ends where the Morans Falls and Python Rock tracks begin. This track is formed, mainly flat and suitable for wheelchairs and prams. Due to Parks and Wildlife conducting controlled hazard reductions in the area I didn’t walk any further as the smoke was very heavy and made conditions a little unpleasant. 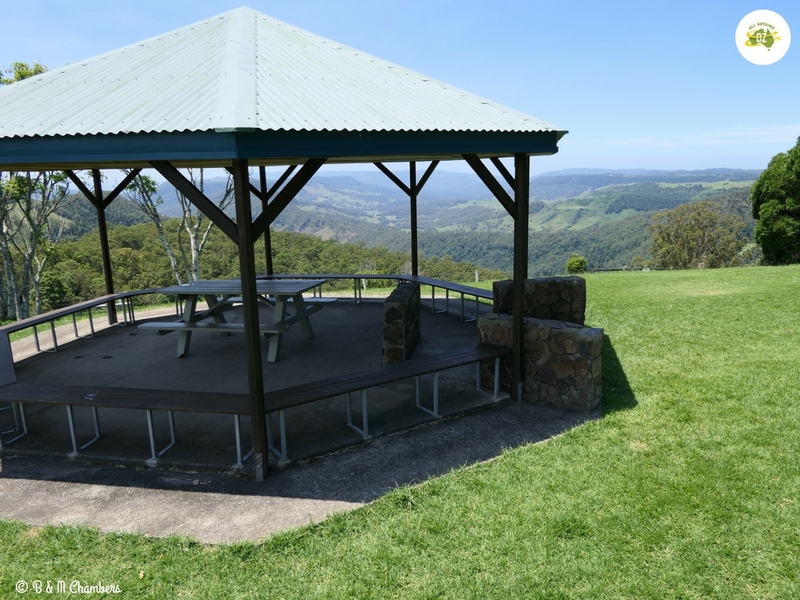 When you’ve finished enjoying the scenery along the Tree Top Walk, you will find a lovely picnic area, with lots of shade, tables and barbeques. It’s a great spot to relax and enjoy some lunch. Or you can head over to O’Reilly’s Mountain Cafe and Gift Shop where you can enjoy lunch, coffee and cake or an ice cream. There is also a small mini-mart next door that offers takeaway items. Breakfast and dinner is also available at O’Reilly’s Rainforest Retreat in the main dining room. 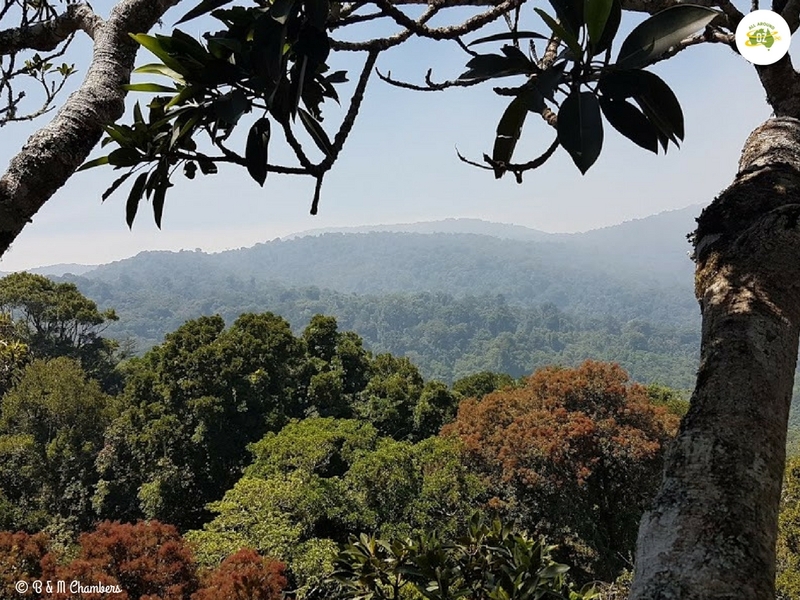 O’Reilly’s Rainforest Retreat offers a number of different accommodation options including the Lost World Villas which a perched on the hillside to the newly appointed, compact Hikers Hideout room. A small, basic room perfect for those that want a good nights rest after a day of hiking. O’Reilly’s Retreat and Villas is a lovely place to stay on the mountain. For the campers among us, Green Mountain Campground is located next to O’Reillys. A Parks and Wildlife camp ground, you will need to purchase a permit on line before setting up camp. There are about 45 camp sites available with some suitable for camper vans. Toilets and showers are also available. On our return trip back down the mountain we stopped off at Kamarun Lookout. This lookout has the absolute best views that I could sit and look at all day. There is a lovely picnic shelter and lots of green grass around so this is where we enjoyed a late afternoon snack. How good is the view from the picnic hut at Kamarun Lookout! So next time you are looking for a great short break or a day trip from the Gold Coast we highly recommend checking out O’Reilly’s Rainforest Retreat. For more information on O’Reilly’s Rainforest Retreat you can visit their comprehensive website HERE. To book your Green Mountain campground permit,visit the National Parks website HERE.